Last week, the quarterly Interagency Autism Coordinating Committee meeting took place. IACC is a government advisory panel responsible for setting federal research priorities. 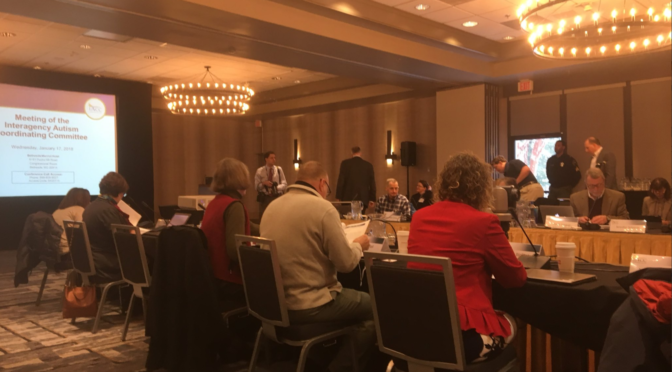 A thread running throughout the six hour meeting was representation and diversity, or lack thereof, both in autism community leadership positions and within IACC itself. In many ways, the sessions were a string of events demonstrating not only the need for more autistic representation, but the need for racial diversity. There are currently only two autistic members of IACC. A third autistic member, Amy Goodman, stepped down in 2017. Similarly, IACC’s membership is almost entirely white. Dr. Marcella Ronyak, IACC member and Deputy Director of the Division of Behavioral Health for the Indian Health Service, gave the first presentation of the day. She began by asking how many people in the room had a good understanding of what Indian Health Services is and what it is that they do around autism issues. Only a few hands went up in a packed room. She went on to give an overview of what her department does — What services are provided, cultural barriers, navigating an ever shrinking pot of funding, and other issues vital to the American Indian community. Dr. Susan Daniels set the record straight, listing several other parent members of IACC. “We do have Allison Singer, who is a parent on our committee… Edlyn Peña is a parent. Kevin Pelphrey is a parent, and [Marcella] Ronyak is a parent.” Additionally, Robert Ring is a parent and John Elder Robison is both autistic and a parent. Parents of children with high support needs are not underrepresented, unless Ms. Singer is willing to make the claim that her child is singularly afflicted in comparison to every single other IACC parent member’s child. Racial diversity was not discussed again for the remainder of the meeting. The next IACC meeting will be on April 19, 2018. You can submit your own comments, to read or be read at the meeting by emailing IACCPublicInquiries@mail.nih.gov. Nominations for new public members will open in 2019. Yes, Ms. Singer is probably willing to make that claim, if the interactions some of us have had with her are any indication.